But the weather forecast shows this to be the most favorable day in a while. So no crawling back into bed for a few more winks, even though it was only a few hours sleep. I’ve got to keep moving. Weather changes fast here on the east coast, so I don’t want to waste a minute of sunshine. I am stalking puffins. I’m not much of a “birder,” but when it comes to those adorable quirky cousins of the penguin, I want to see them up close. 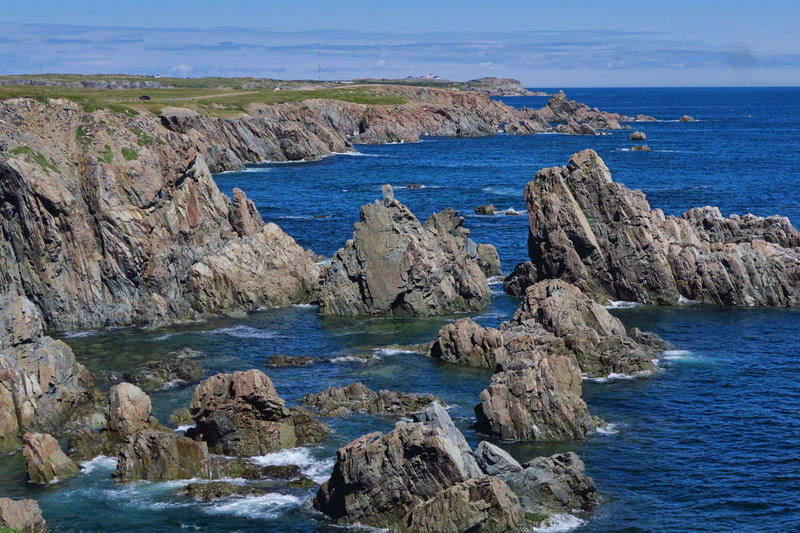 I’ve read the best chance to do that is in nearby Elliston, just about five miles from Bonavista. 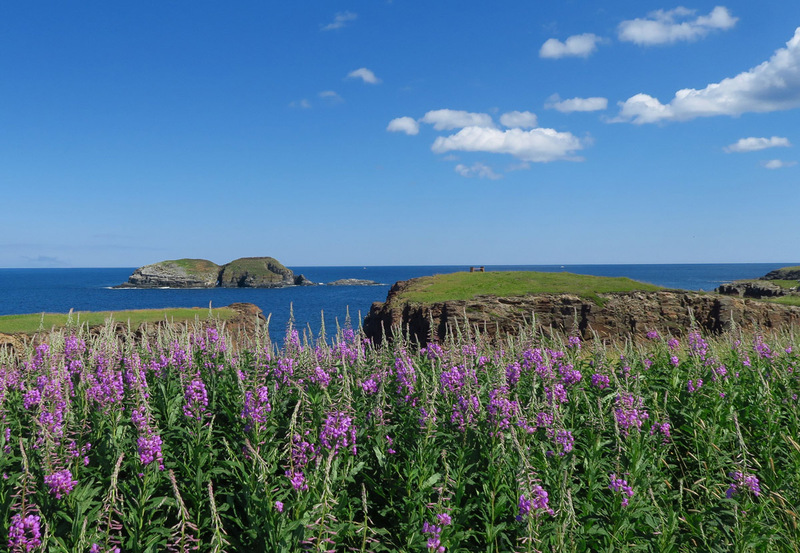 In fact, the Newfound and Labrador tourism website has this to say, “Elliston’s puffin viewing site offers the closest view of puffins from land in North America. 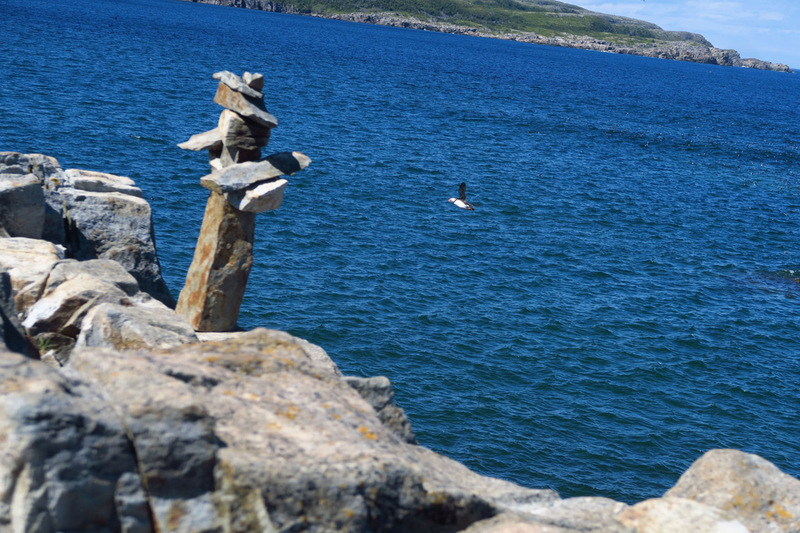 Puffins fly close to viewers and often land on the cliffs just several feet away.” Several feet away! 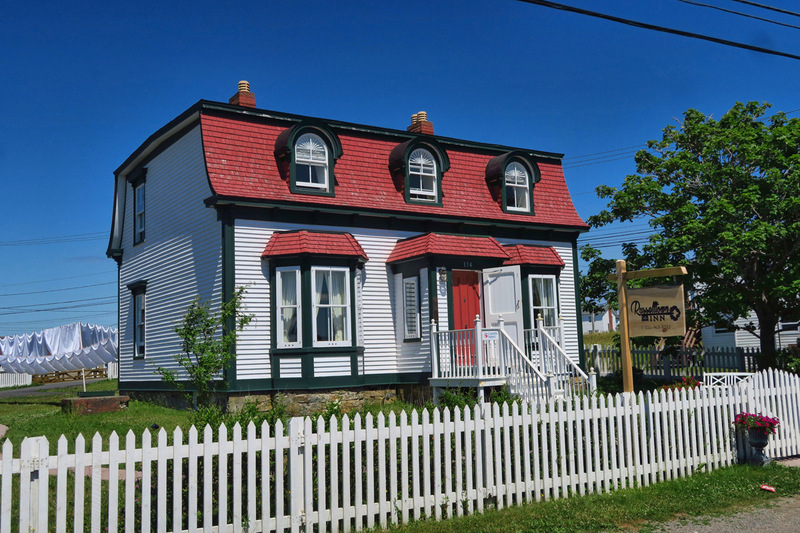 Bonavista has some interesting turn of the century architecture. This one really makes me sad. 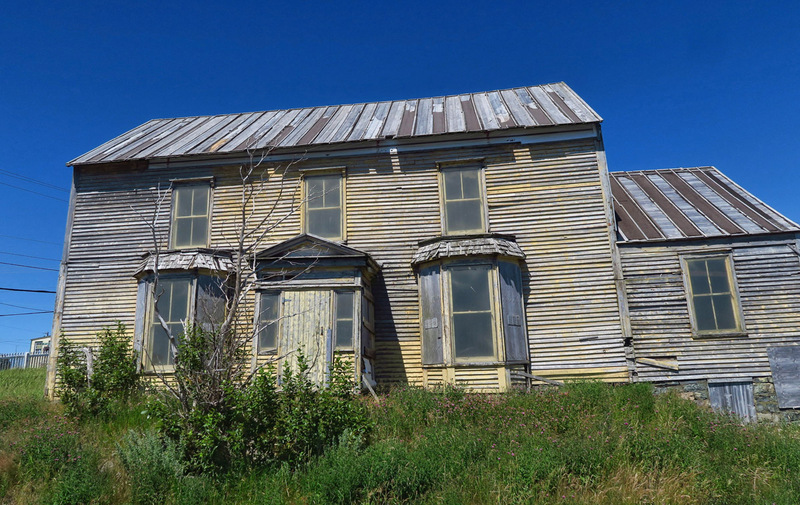 Known as “The Bridge House,” built between 1811 and 1814,is the oldest documented residential property in the province of Newfoundland and Labrador. It used to have beautiful dormer windows and side chimneys on the roof. 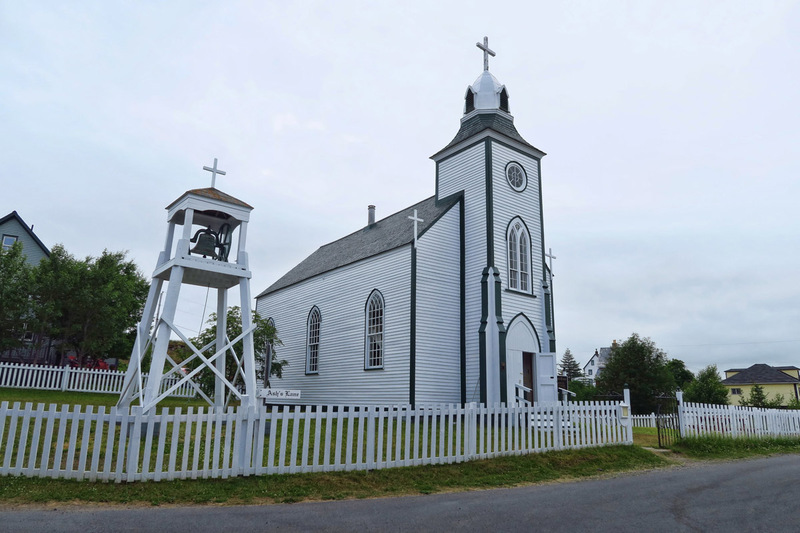 Although it’s been designated as a Registered Heritage Structure, there has only been enough funding for emergency repairs. 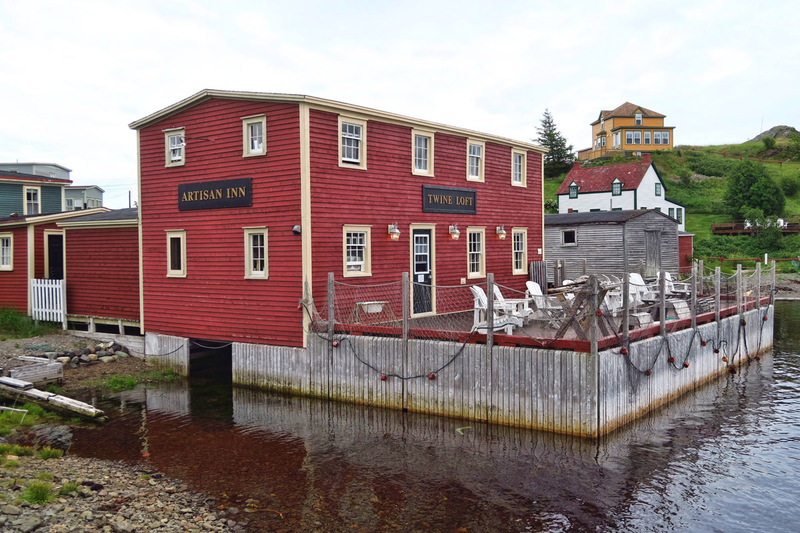 Elliston’s other claim to fame is “The Root Cellar Capital of the World.” Good to have a back-up tourist attraction for those months when the puffins are done breeding and head off to sea. 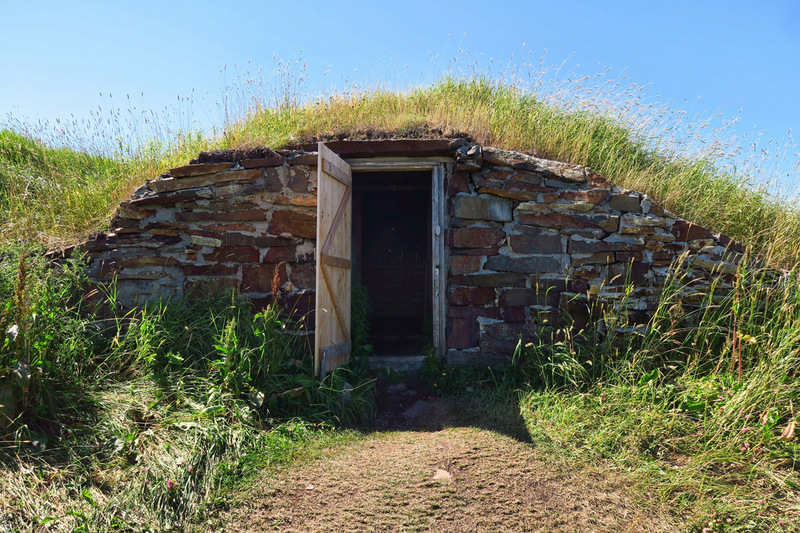 More than 130 root cellars have been found in Elliston, the oldest dating back to 1839, still in use. These earth-covered cold-storage units used for potatoes, carrots, turnips, and to a lesser extent, meat and dairy, remain dry and at a constant temperature year round. 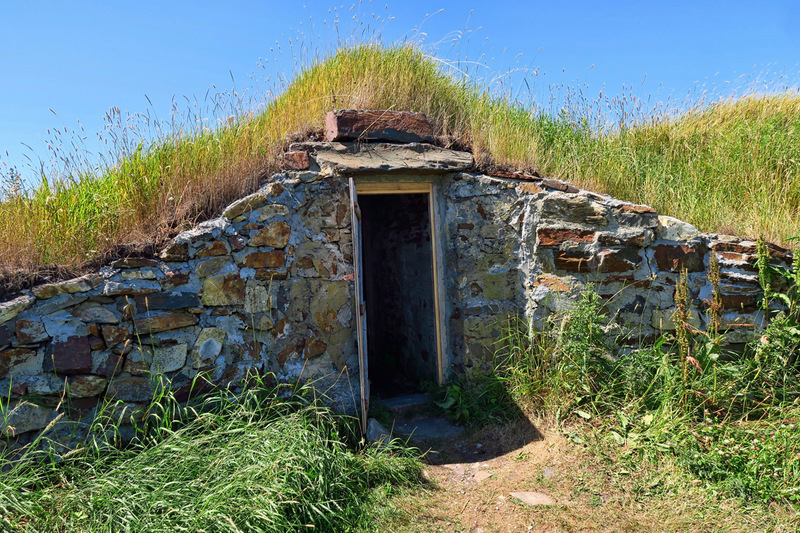 Elliston claims to have over 100 working root cellars. Whenever I visit a new place, I always like to sample the local specialties. 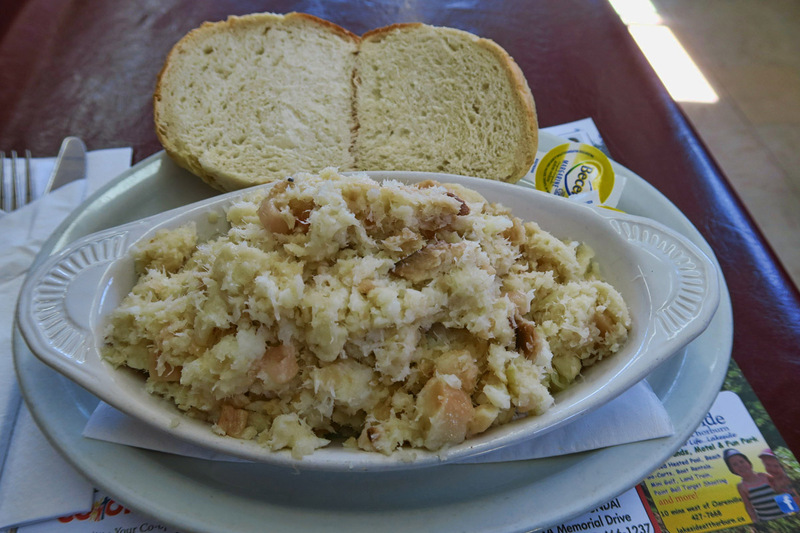 This one is called “Fish & Brewis,” and “sample” is about all I did….It won’t be among the meals that bear repeating. 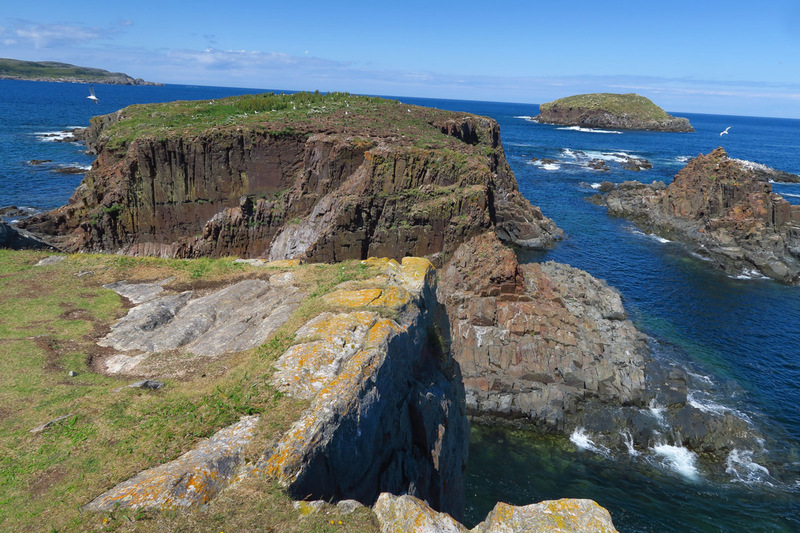 But I’m not here to see root cellars, I want to see puffins! 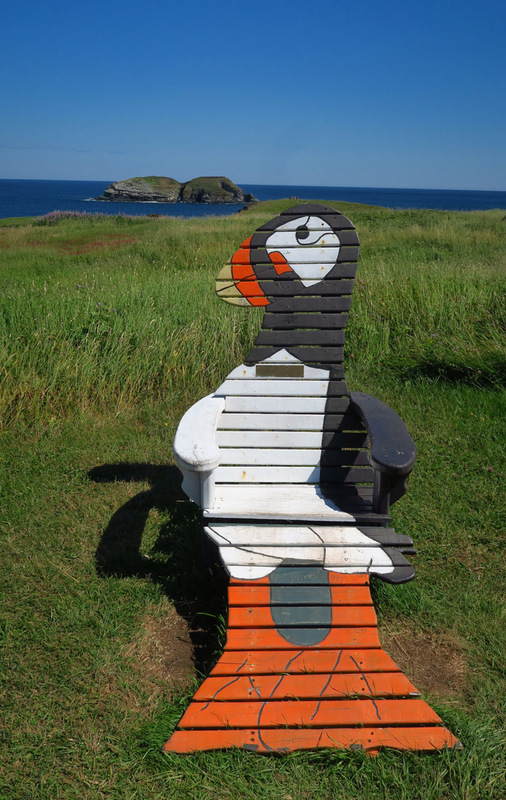 I stop at the Visitor Center/craft shop for directions to the “puffin viewingsite,” a point out on the edge of a promontory, overlooking an island of nesting puffins. 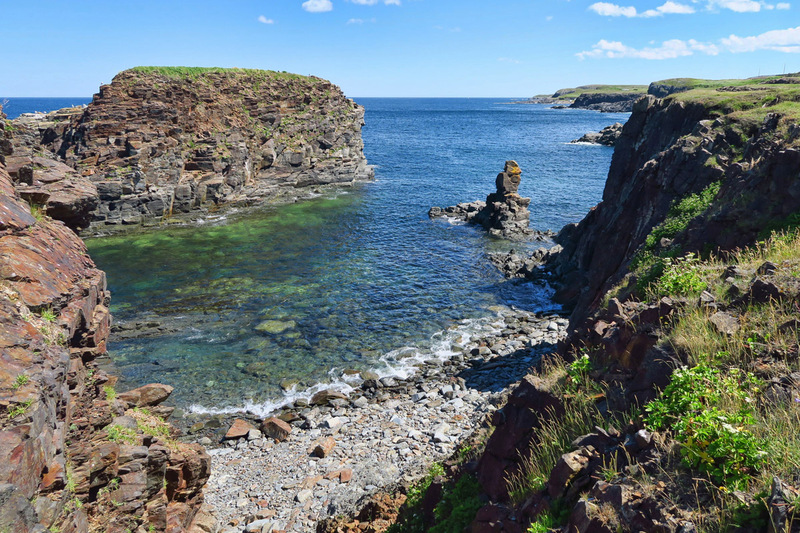 This bluff for viewing is separated from the nesting island by only a few yards. If you look just above the land, you will see hundreds of tiny black specks. 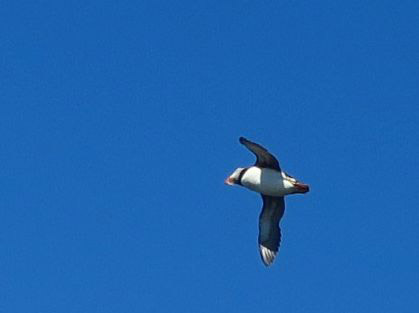 Those are zooming puffins. 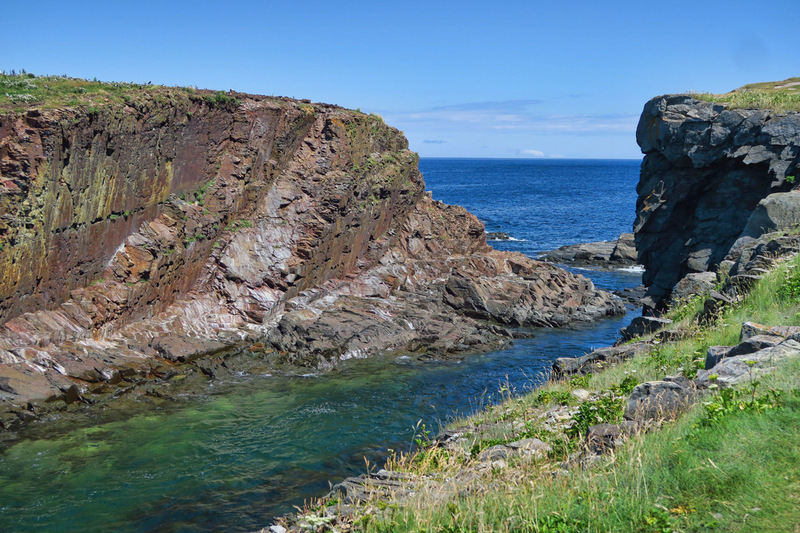 Here, you can see only a small sliver of water separates the people side from the puffin side. 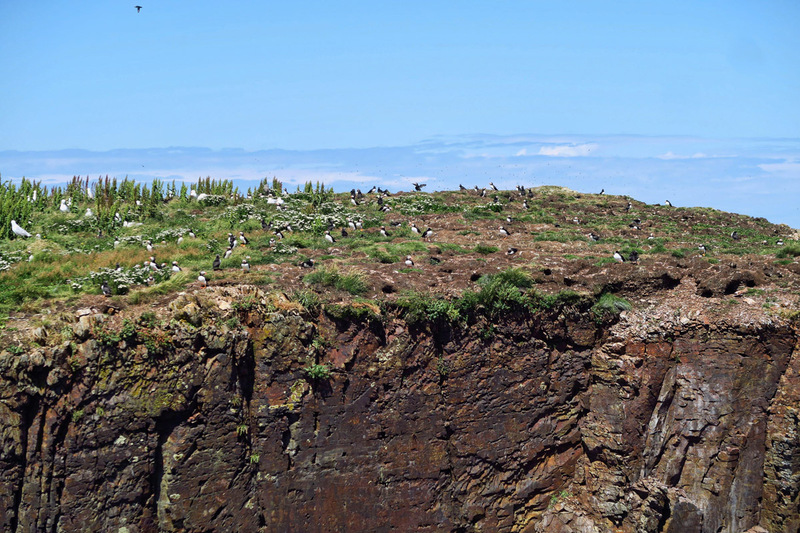 Puffins actually build burrows as nests, for which the turf on the top of this island is ideal. Take a seat in the flight path and wait…. This is as far out on the point as people can go. 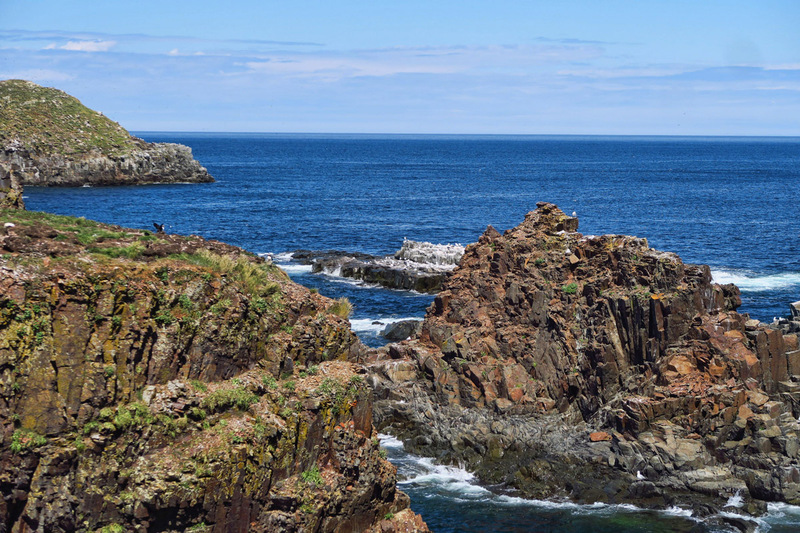 The puffins are on the island beyond. Still, even with no puffin encounter, the view here is pretty spectacular! More beautiful views around the puffin site. 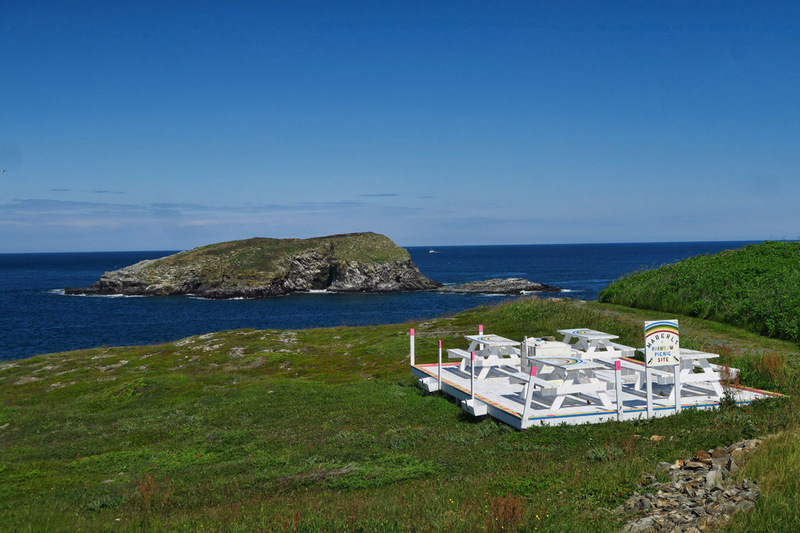 Rainbow Picnic area at the Maberly Road Lookout, just above the Elliston Puffin Viewing site. 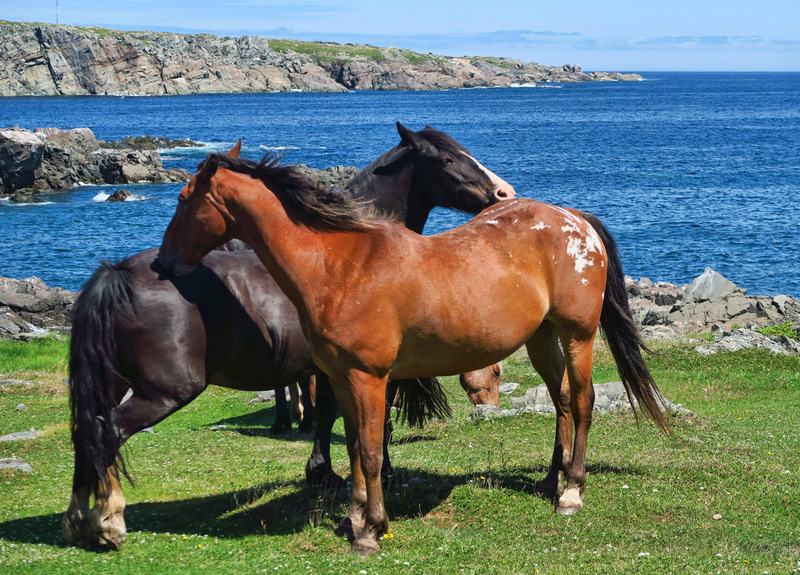 I move on down the eastern edge of the Bonavista Peninsula to the little seaside towns of Port Rexton and Trinity, known as a “heritage community.” Established back in the early 1700’s, Trinity’s protected harbor made it ideal for fishing ships making their way over from Europe for the cod fishing. It was also the site of the first court of justice in North America, established in 1615. 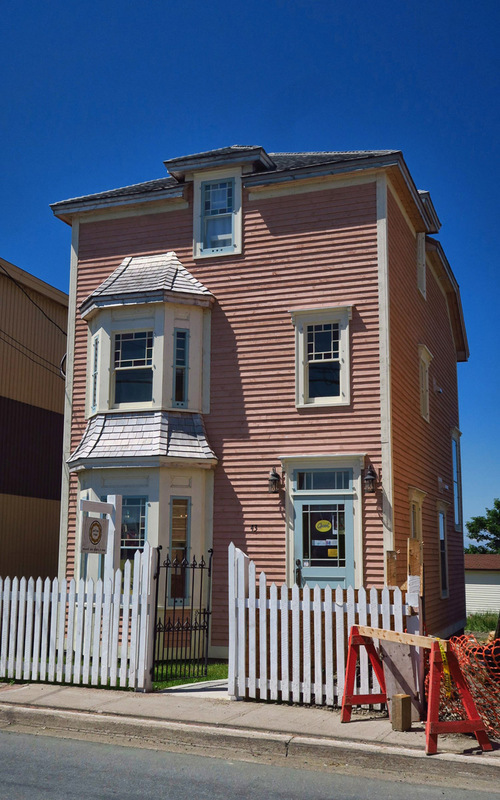 Many buildings throughout the town have been lovingly restored as Registered Heritage Structures by the province, but thankfully not overly done. 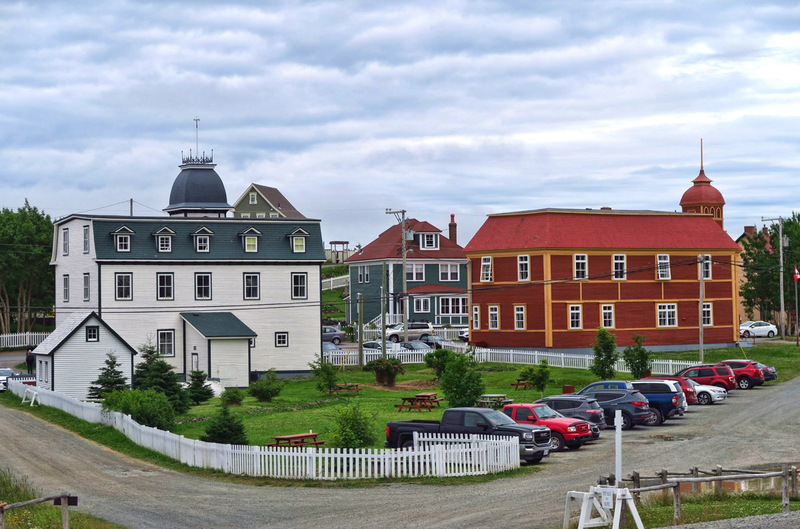 The town of Trinity has been featured as sets in the movie, The Shipping News, and the TV miniseries, Random Passage. 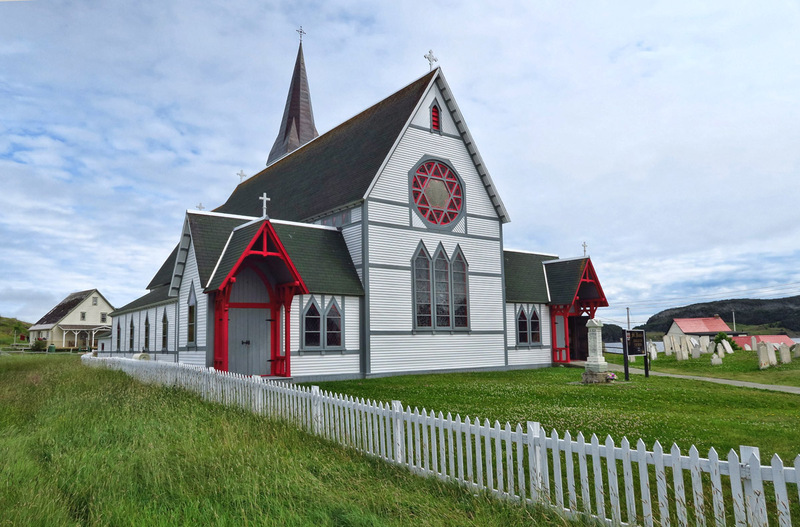 St. Paul’s Anglican Church, the third church on this site, built 1892. 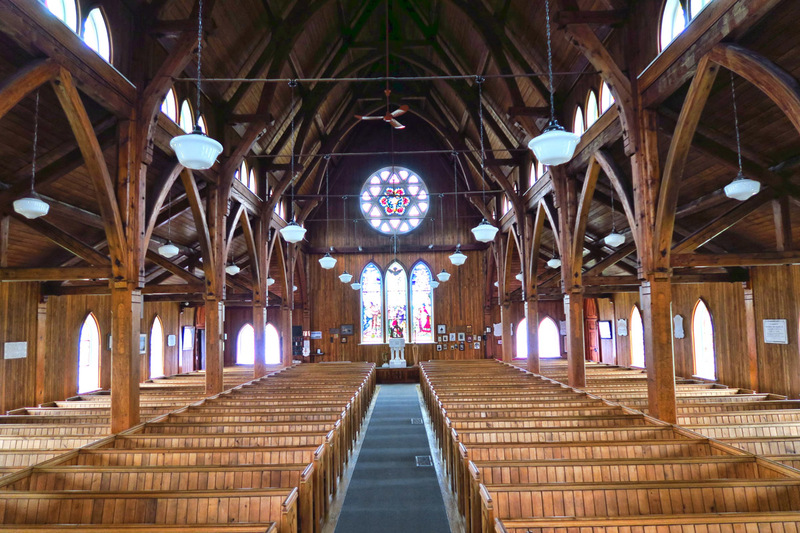 The woodworking inside the church is impressive. The Rising Tide Theater. They put on a “moving play” in period costume that moves around the town explaining the history. 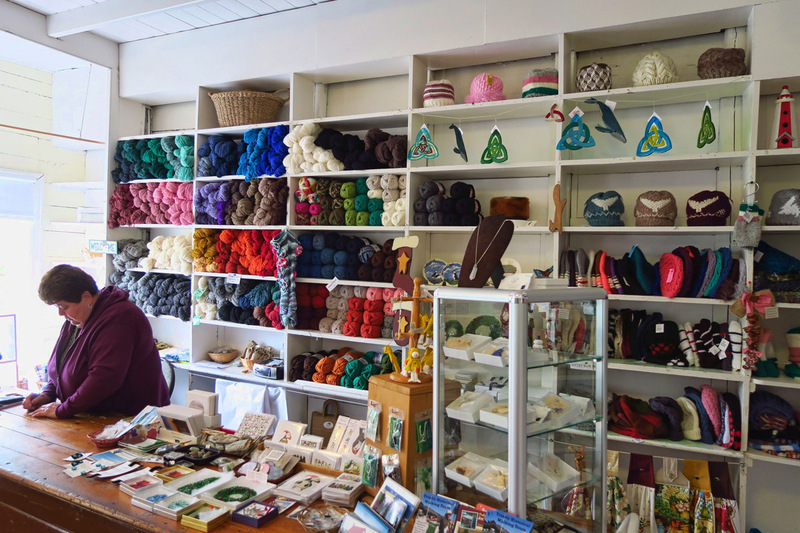 A whole lot of knitting takes place in Newfoundland. Gotta find a way to pass those cold winters. 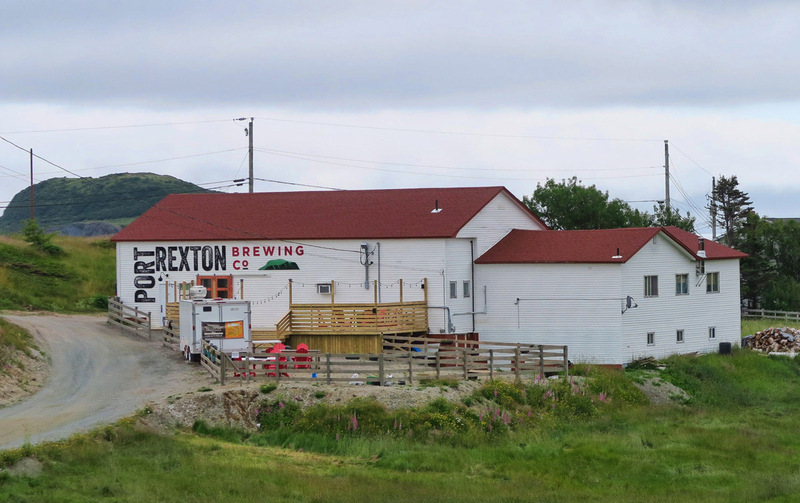 Port Rexton Brewery…not the best Porter I’ve had, but they get a bonus for trying in this remote land! But those puffins are still haunting me. 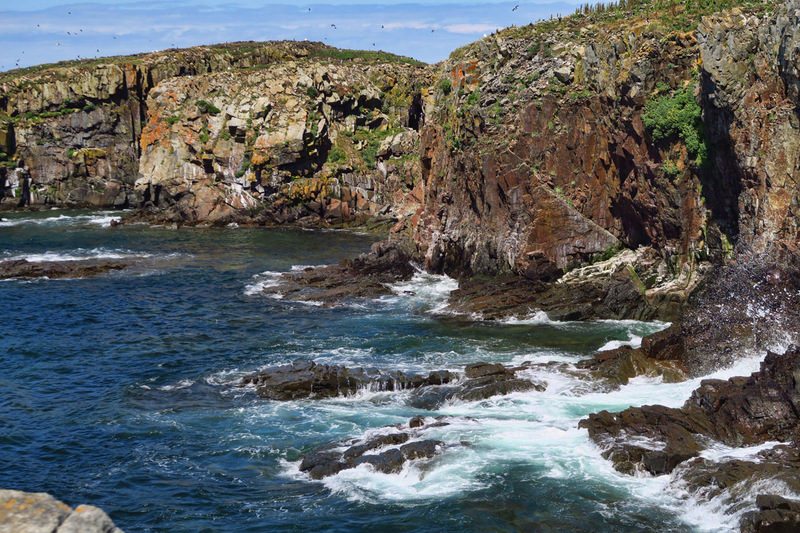 Should I return and backtrack thirty miles up from Trinity to Elliston and try again for an up close and personal puffin experience? Or keep pointing south, accepting that it’s not meant to be? 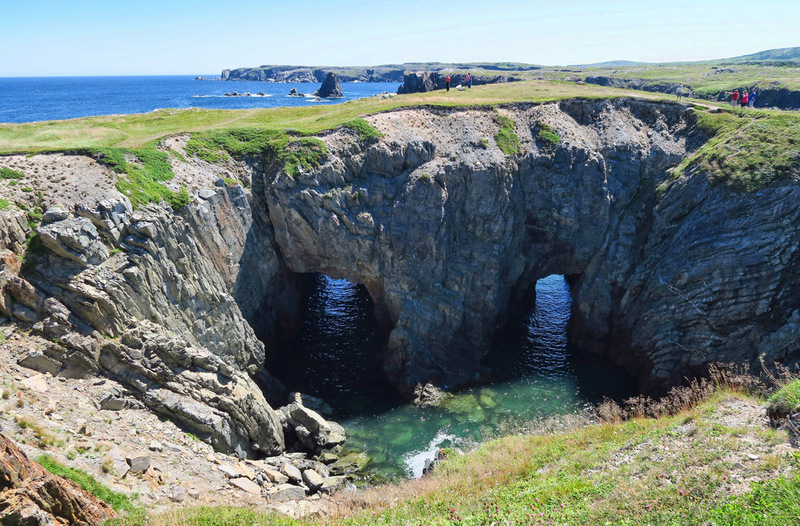 This entry was posted in Canada, Newfoundland and tagged Bonavista Peninsula, Elliston, Port Rexton, puffins, root cellars, Trinity, Trinity Bay by Suzanne. Bookmark the permalink. Can’t believe you didn’t like fish n brewis! I luvs it I do! 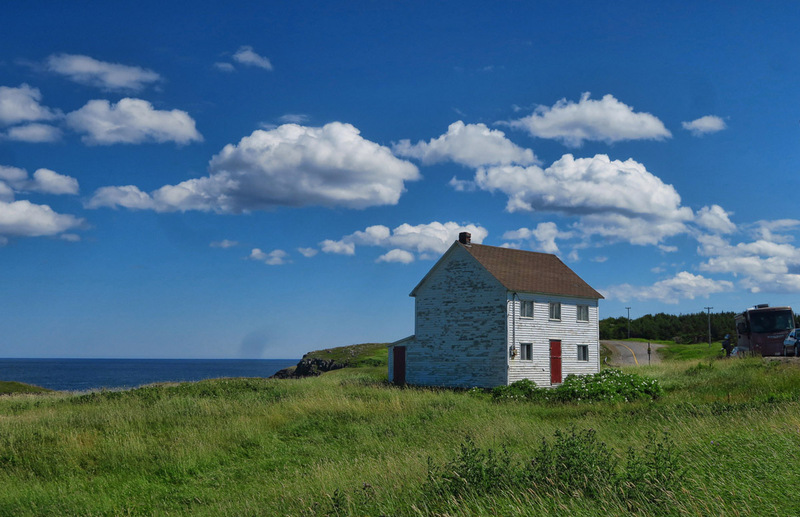 Unlike most of the western U.S., with its preponderance of mobile homes and metal buildings, it seems the “Newfies” have maintained their architectural soul….Canadians in general, actually. I love all the lovely buildings in these towns. 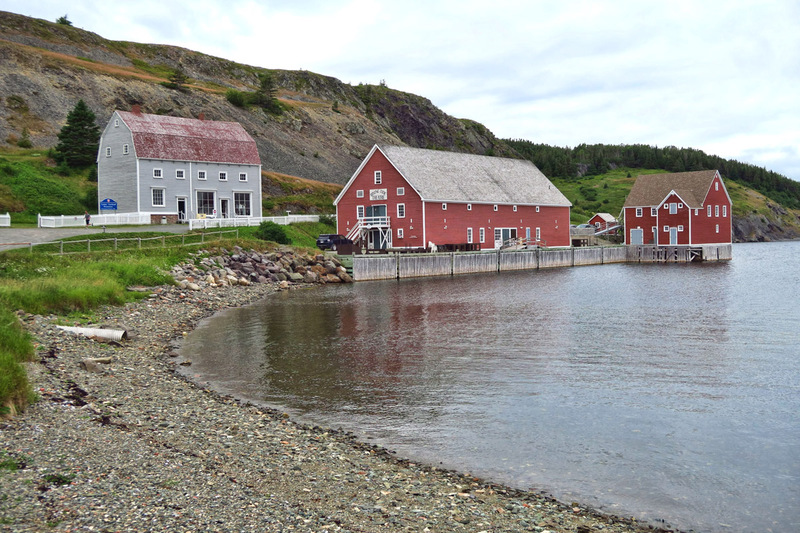 All the fishing villages and outlying areas of the Maritimes were so quaint to travel through. 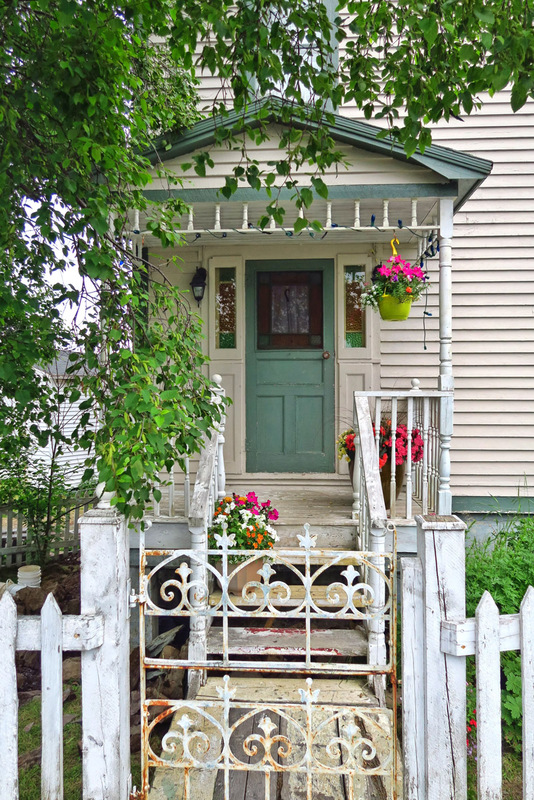 Beautiful photos of the homes and churches. Sorry about your puffin visit:( You needed a time when no one else was there. 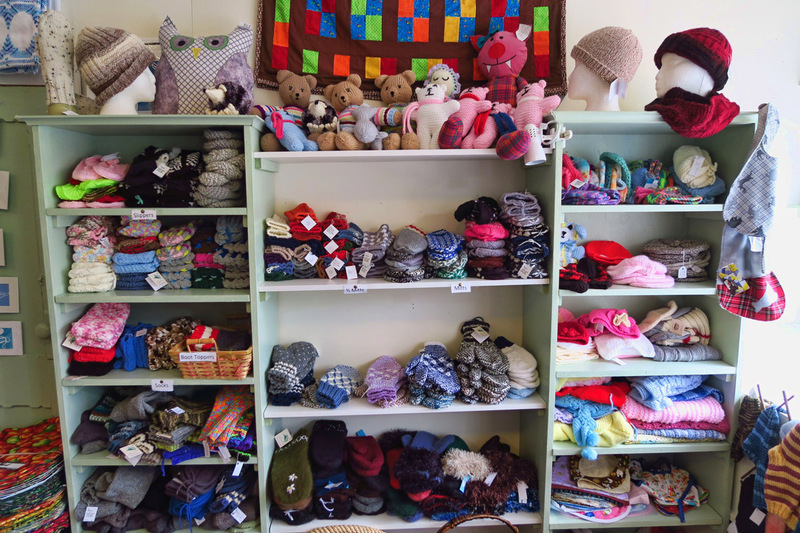 Ooops… we forgot to tell you about Aunt Sarah’s Chocolate shop in Trinity… sorry. As for the rest of it, don’t give up on the puffins! Waiting for those puffin close-ups. Back track!! It is so worth it to see the puffins up close. I think it was my second visit when I saw most of them on the “people side”. Love your pictures, it makes me want to go back! Pam, backtrack, I did! And mainly because of your beautiful photos on your blog! Thanks again for all the great advice! The houses are very boxy! I love the root cellars, I’m a sucker for rustic stone and a turf roof! I hope you got your puffin encounter!